The holidays are over, the decorations are put away. As we begin a New Year many of us look back on the past 12 months. What happened? Did we accomplish those things we wanted to achieve? Lose weight? Change jobs? Eat healthier? And what about our children? Did they achieve their goals? These days, pressure on kids can be very high. The are expected to get into a top college, playing sports at a varsity or higher level. But what being happy and feeling successful? Did you know a large percentage of children stop playing organized sports in the US after the age of 13? The reason? They aren’t the top player in that sport, they aren’t the star. So they quit. The pressure in children’s athletics is to be the best. What ever happened to playing a sport for it’s own sake? What happened to fun? Something I love about the sport of tennis is the variety of ages and abilities of people who play simply for enjoyment. I watch players from 5 or 6 years old to eighty and up. I love to see families on the court playing and enjoying time together. I have great memories of playing with my parents and siblings, and it’s something we still do, even if does get a little competitive! We need to show our kids that they may not ever win Wimbledon or an NBA title, and that’s OK! The best gift we can give our kids is a lifetime enjoyment of sports, activity and exercise. Once kids have mastered the basics of tennis, it is something they will have for their lifetimes. What a great gift to give your child. Yes, times have certainly changed! And that includes the game of tennis! Does anyone ever see wooden racquets? Only in the Tennis Hall of fame! Like everything, tennis has evolved. It has become so much easier for us all. Racquets are lighter and more powerful. A 130 MPH serve was impossible with a wooden racquet! Professionals now do so regularly. The best part for tennis enthusiasts who want to teach the game to their kids and grandkids: racquets now come in many different sizes. Including, small enough for a 3 year old child. Balls have changed too! They are now slower and lighter for small children. Even the nets have changed! They are shorter and easier to hit the ball over. And, with these trends, is it any surprise that new court sizes have been developed for players of all ages. 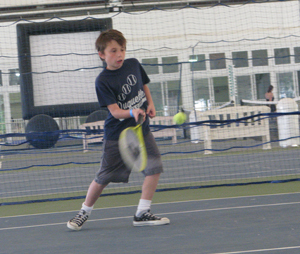 The game of tennis is now accessible to even the youngest enthusiasts! Yes times are changing. For tennis this means focusing on fun! Kids are more inclined to learn what they love. Stop by the front desk and ask about our new 10 and Under Tennis programs. We know that you and the kids in our life will love them! Tennis Just Became Kid Friendly! 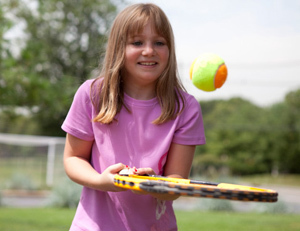 Watch this entertaining video to learn more about new ten and under tennis options. Smaller courts, smaller tennis racquets and slower, brightly colored tennis balls all serve to make learning the game easier for our kids! FIELDS 60 Cut 5 from 10 and Under Tennis on Vimeo. To learn more about these options, call the Junior Tennis Academy at Dedham Health and Athletic Complex! Top 5 Reasons Tennis Is for Everyone! Intrigued by taking up a tennis racquet, but feel a bit out of your league? Not sure it’s worth the time and energy to learn? Think it’s just for the fit or the young or the ambitious? Think again! Take a look at our Top 5 Reasons for Playing Tennis! 5. It’s an excellent workout for both your heart and your brain. Not only is tennis a pleasurable way to get in a cardio session, but it gives your brain a workout as well. All that strategy, planning and technique improvement? Yup, it’s a thinking sport. 4. It’s a great way to make new friends. Many tennis partners become good friends. One of our club members recently moved here from the Midwest. She knew no one in this area. Because of tennis, she now has a new network of friends both on the court and off the court. 3. It’s a family sport. Grandparents, parents and children can all play together. It is not unusual to see families playing doubles, especially during the holiday season. 2. It’s a sport that you can play forever. Many of our tennis players are in their 60’s and 70’s. My oldest, and one of my dearest students, played until she was 90! It reminds me of being a kid again, out in the playground at recess. Tennis is a great stress reliever! Why do you play tennis? Want to learn more? 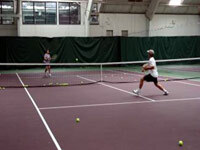 Visit our tennis pages and learn about our programs for adults and kids alike. Hope to see you on the court!